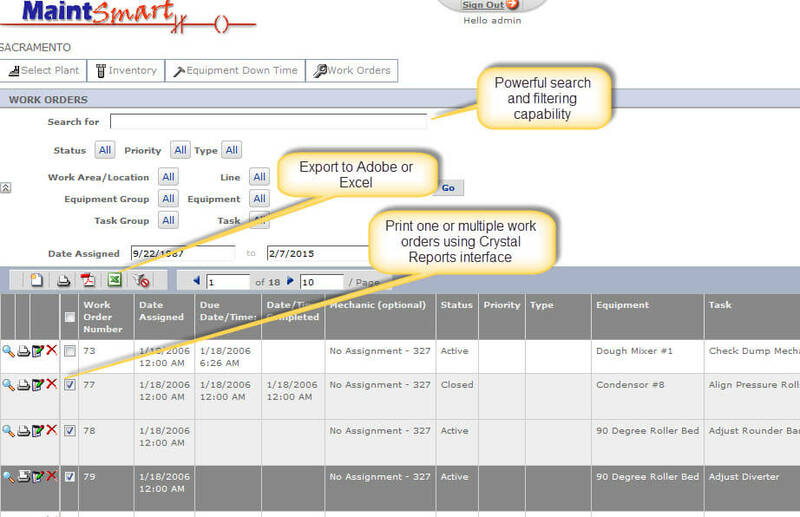 Work order software for work requests (repair ticket) web-based or access from CMMS software. What is a Repair Ticket? This work order software offers an integrated repair ticket system. A repair ticket is a work request usually submitted by a non-maintenance person for the purpose of requesting service or repair of equipment. Typically the equipment is equipment operated by the requester. The repair ticket (work request) is added to the work order database but since it has a 'Request' status it is separated from the actual work orders. Once the request has been examined and assigned to maintenance it attains 'Active' status and is thereafter considered a work order. Repair tickets (work requests) provide a paper-trail back to the original requester. Additionally submitting a repair ticket through the work order software ensures that this work will be in front of the maintenance department. Once a repair ticket is added to the system the original requester can edit the request only while in Request status. Once the work request has been elevated to Active status the request (now actually a work order) may not be edited by the original requester. The requester only sees their requests and can follow the status changes associated with their requests as the work order progresses to completion. Repair Ticket Has Been Completed, Now What Happens? After the work order associated with the original repair ticket has been closed the original requester can enter a user satisfaction survey on the work order. the maintenance manager has complete control over whether or not to allow this and if allowed has complete control over the questions and rating that are available to the requester on the survey. Users that belong to the Requesters user group have access (and usually only access) to the work request (or repair ticket) screen through the web-based work request module (Web Work Requester). Creating a web work request is very simple. Enter optional comments to describe issue. When a request is submitted it automatically logs the user ID against the repair ticket so that the maintenance manager can always go back to the original requester with additional questions or explanation. The status is also forced to Request and the date fields are all locked. Essentially the process is similar to the web-based work request. 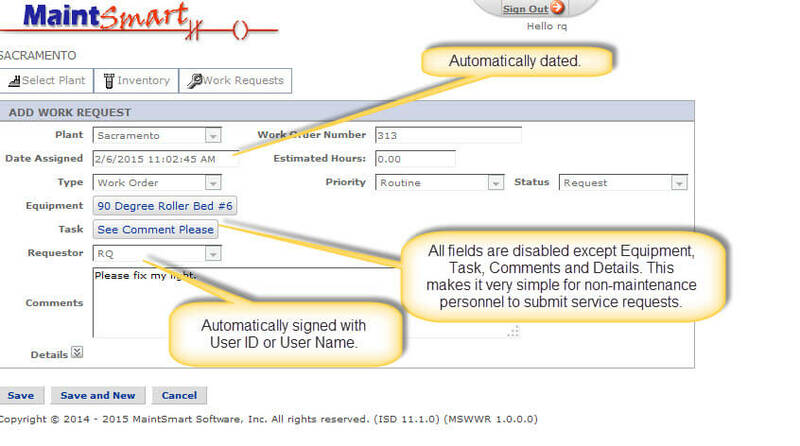 The main difference is the requester is using the main CMMS software to access the work request screen. The same fields are available and the record is stored in the same database. All work requests are available in the main work order software (MaintSmart Enterprise) for elevation to Active work order status. The status may also be changed to Active from the Web Work Requester by a user with adequate permissions. One useful feature in the main CMMS software is the ability to create filters that display only repair tickets. These disappear from the screen (as long as filter is active that is) as each is elevated to Active work order status. This makes it ridiculously simple to account for all requests. 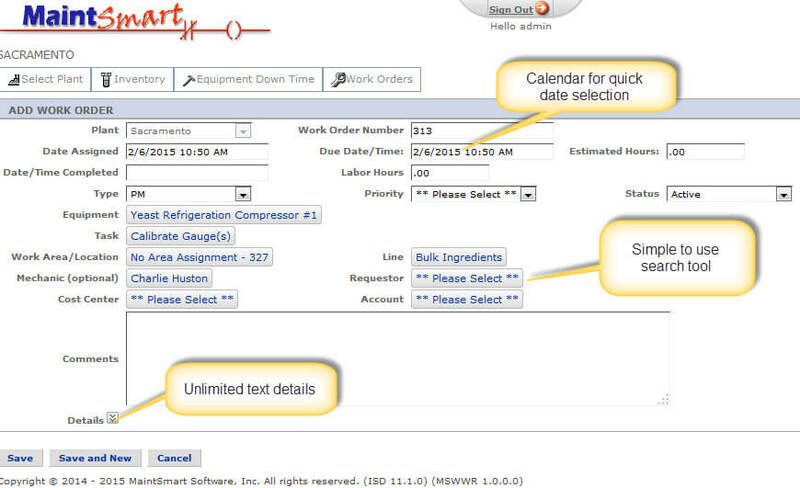 Ask about how you can use the Print/Email Scheduler module to further automate this processes! As with the rest of the CMMS program much is offered to the user in this package but the users is never required to use the software beyond their particular needs. This is also the case with the repair ticket -> work order system. An optional work request customer satisfaction survey is available so that the original requester can comment on the completed work. The survey's existence as well as the survey questions and ratings are managed solely by the maintenance manager. Implement this if you want to or ignore it. This web page is accessible to users that are members of the Requester Only permissions group. Only two required fields with optional comments (255 characters) and Details (2GB text) make this extremely simple to use. Display of web page for full work orders. Requires adequate permissions to access this page.